The Sanctuary of Imam 'Ali (Arabic: حَـرَم ٱلْإِمَـام عَـلِي‎, translit. Ḥaram al-Imām ‘Alī), also known as the Mosque of 'Ali (Arabic: مَـسْـجِـد عَـلِي‎, translit. Masjid ‘Alī), located in Najaf, Iraq, is a Shi'ite Muslim mosque housing the tomb of 'Alī ibn Abī Tālib, the cousin of Muhammad and the first Shi'ite Imam after him, and the fourth Sunni Rashid Caliph. According to Shi'ite belief, buried next to Ali within this mosque are the remains of Adam and Nuh (Noah). Each year millions of pilgrims visit the Shrine and pay tribute to Imam Ali. The Abassid Caliph Harun al-Rashid built the first structure over the tomb of Imam 'Ali in 786, which included a green dome. The Caliph Al-Mutawakkil flooded the site in 850, but Abu'l-Hayja, the Hamdanid ruler of Mosul and Aleppo, rebuilt the shrine in 923, which included a large dome. In 979-980, the Buyid dynasty Shi'i sovereign 'Adud al-Dawla, expanded the shrine, which included a cenotaph over the burial site and a new dome. This included hanging textiles and carpets. 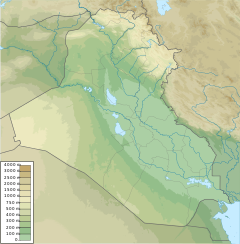 He also protected Najaf with a wall and citadel, while providing water from the Euphrates via a qanat. Seljuq Sultan Malik-Shah I contributed large gifts to the shrine in 1086, as did Caliph Al-Nasir. The vizier Shams al-Din Juvayni added facilities to serve the pilgrims in 1267, and Sultan Ghazan Khan added the Dar al-Siyada wing for the sayyids in 1303. A fire destroyed the shrine in 1354 but was rebuilt around 1358 by Jalairid Sultan Shaikh Awais Jalayir. He also interred his father's remains, Hasan Buzurg in the courtyard. Timur ordered the restoration of the shrine after a visit to Najaf. Suleiman the Magnificent also offered gifts, which probably helped restore the shrine, after a visit in 1534. The Safavid Shah Ismail I visited in 1508, but it was Abbas I who visited Najaf twice and commissioned 500 men to rebuild the shrine in 1623. The restoration was completed by his grandson Shah Safi al-Din in 1632. This restoration included a new dome, expanded courtyard, a hospital, kitchen, and hospice, so as to accommodate the numerous pilgrims. The cenotaph was restored in 1713 and the dome stabilized in 1716. Nader Shah gilded the dome and minaret from 1742-1743, while his wife paid for the walls and courtyard to be rebuilt and the retiling of the iwan faience. In 1745, the iwan was rebuilt as a gilt muqarnas of nine tiers. In 1791, a raised stone floor covered the tombs in the courtyard, creating a cellar space for them. The Ottoman Sultan Abdülaziz rebuilt the Clock Portal (Bab al-Sa'a) and the Portal of Muslim Ibn 'Aqil in 1863 and the former gilded in 1888 by Qajar Sultan Naser al-Din Shah Qajar. During the uprising of March 1991, following the Persian Gulf War, Saddam Hussein's Republican Guards damaged the shrine, where members of the Shia opposition were cornered, in storming the shrine and massacring virtually all its occupants. Afterwards, the shrine was closed for two years, officially for repairs. Saddam Hussein also deported to Iran a large number of the residents of the area who were of Iranian descent. As the burial site of Shia Islam's second most important figure, this Mosque is considered by all Shi'ites as the third holiest Islamic site. The Boston Globe reports "for the Muslim Shias, Najaf is the third holiest city, behind Mecca and Medina in Saudi Arabia." It is estimated that only Karbala, Mecca and Medina receive more Muslim pilgrims. A hadith attributed to Ja'far as-Sādiq, the Sixth Imami Shī'ite Imām, mentions the site as one of "five definitive holy places that we respect very much". The site is visited annually by at least 8 million pilgrims on average, which is estimated to increase to 20 million in years to come. Many Shī'ites believe that 'Alī did not want his grave to be desecrated by his enemies and consequently asked his friends and family to bury him secretly. This secret gravesite is supposed to have been revealed later during the Abbasid caliphate by As-Sadiq. Most Shī'ites accept that 'Alī is buried in Imām 'Alī Mosque, in what is now the city of Najaf, which grew around the shrine. It has also been narrated from As-Sadiq that Imām 'Alī Mosque is the third of five holy places: Mecca, Medina, Imām 'Alī Mosque in Najaf, Imam Husayn Shrine in Karbalā, and the Shrine of his daughter Fāṭimah in Qom. The mosque is well known for its big dome. Near its big door are two minarets. The big dome is covered in 7777 brick slabs painted in gold, there are also turquoise mosaics that cover the side and back walls. April 10, 2003, Shia leader Sayed Abdul Majid al-Khoei, the son of Grand Ayatollah Abu al Qasim al-Khoei, was killed near the mosque. Al-Khoei had returned from exile in Britain to encourage cooperation with the U.S.-led occupation of Iraq. August 29, 2003, a car bomb exploded outside the mosque just as the main Friday prayers were ending. Somewhere between 85 and 125 people were killed, including the influential Ayatollah Sayed Mohammed Baqir al-Hakim, the Shia leader of the Supreme Council for the Islamic Revolution in Iraq. The blast is thought to be the work of Abu Musab al-Zarqawi. May 24, 2004, unidentified mortar fire hit the shrine, damaging gates which lead to the tomb of Imam Ali. August 5, 2004, Muqtada al-Sadr and the Mahdi Army seized the mosque and used it as a military base for launching attacks against the Iraqi police, the provincial government and coalition forces. The fighting was eventually ended by a peace agreement. Although the neighbouring buildings suffered considerable damage, the mosque itself suffered only superficial damage from stray bullets and shrapnel. August 10, 2006, a suicide bomber wearing an explosive harness blew himself up near the shrine, which killed 40 people and injured more than 50 others. ^ a b al-Qummi, Ja'far ibn Qūlawayh (2008). Kāmil al-Ziyārāt. Shiabooks.ca Press. pp. 66–67. ^ a b c Tabbaa, Yasser; Mervin, Sabrina; Bonnier, Erick (2014). Najaf, The Gate of Wisdom. UNESCO. pp. 32, 73–81. ISBN 9789231000287. ^ Battutah, Ibn (2002). The Travels of Ibn Battutah. London: Picador. p. 56. ISBN 9780330418799. ^ "Red tape curbs profits from Iraq religious tourism". Reuters. 2009-02-16. Retrieved May 9, 2009. ^ al-Qummi, Ja'far ibn Qūlawayh (2008). "10". Kāmil al-Ziyārāt. trans. Sayyid Mohsen al-Husaini al-Mīlāni. Shiabooks.ca Press. p. 67. This page was last edited on 5 April 2019, at 18:44 (UTC).